SPRING FEVER: Your Choice: (2 Year Warranty) or (SAVE $300)!Ends April 30, 2019. 2019 Can-Am® Renegade® X® xc 1000R Black, Grey & Sunburst Yellow PURE SPORT HANDLING Trail adventures with power to spare and handling that hangs on to terrain at your command—of course it's the X xc. Ripping the now 91 horsepower 1000R has never come with so much confidence over terrain—a fully re-engineered suspension will do that. Features may include: Ferocious Rotax V-Twin engines THE STANDARD OF PERFORMANCE The all-new 91-horsepower Rotax 1000R liquid-cooled V-Twin engine, with four valves per cylinder and single overhead camshafts is remarkable for its—dare we say it—more refined thrills. 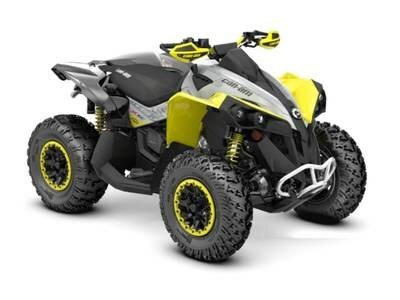 The 78-hp Rotax 850 version also delivers signature Can-Am torque and sound for a true performance edge. Tri-Mode Dynamic Power Steering (DPS) ULTIMATE STEERING Tri-Mode Dynamic Power Steering (DPS) returns easy steering assistance, adapting to the vehicle's speed. At lower speeds, steering power is increased to reduce effort, while at higher speeds it's reduced to offer maximum steering feel to riders. Three modes with distinct performance characteristics are also at your fingertips. FOX PODIUM 1.5 RC2 shocks SET IT UP These high-performance front and rear FOX PODIUM 1.5 RC2 shocks give the flexibility to fit all terrain and all riding styles, with easy-to-make dual-speed compression, rebound and preload adjustments for the conditions you're riding in. 25-in ITP Holeshot ATR tires on 12-in cast aluminum beadlock wheels RUGGED BEADLOCK WHEEL AND TIRE SETUP The best Renegade X xc yet needs rubber that can handle the power—and still return a ride you can't forget. ITP Holeshot ATR tires are installed on 12-in (30.5cm) cast-aluminum beadlock wheels, with a centerless design that reduces unsprung weight and offers improved strength. Durability was increased in strategic areas while excess material was eliminated in other spots to save weight. Fully-revised front and rear suspension DIALED IN It's all about balance. Starting with front arched A-arms, sway bar, and revised wheels for a wider stance for the most significant Renegade upgrade yet. The independent rear suspension eliminates scrub and camber changes for unparalleled vertical wheel control—rather than in a flexive butterfly motion. Renegade was made to go where you point it—with leading traction and power transfer. Aluminum taper-profile handlebars with hand guards WHERE IT COUNTS You're suited up—and definitely want to ride behind revised wind deflectors and a square pad for the look and protection that comes ready for the territory. Why let brush, mud, and cold slow you down?